Find and deliver some forged documents to the Stormcloaks. Speak to Legate Rikke at the Pale Imperial Camp. Find a Stormcloak courier and take his documents. Take the documents back to Legate Rikke. Take the modified documents to Frorkmar Banner-Torn in Dawnstar. "One way or another, get me those documents." After successfully defending Whiterun on behalf of the Imperial Legion, the umbrella quest Reunification of Skyrim will start, as it is high time to conquer all remaining holds currently controlled by the Stormcloaks and once and for all rid Skyrim of Ulfric Stormcloak. Unless you used it for negotiations during Season Unending, your very first target will be to claim the Pale to the north. As General Tullius puts it: "You'd be wasted as a regular soldier. I have special plans for you. You'll be of greater use to me with greater flexibility. Make your way to our hidden military camp in the Pale. Rikke will have important tasks for you, and will need you when we reclaim the capital." When Tullius asks you to regain the Pale, your commander-in-chief Legate Rikke will relocate to the snowy Pale Imperial Camp east of hold capital Dawnstar. Rikke will be located in the easternmost tent, busy studying a huge regional map of Skyrim. When you report for duty she will let you in on her plan to conquer the Pale: "I need you to deliver some false orders to the Stormcloak commander in Dawnstar. But first we need to get our hands on some rebel orders to make the forgeries." She will then explain that a Stormcloak courier will travel back and forth between Candlehearth Hall in Ulfric's home city Windhelm, and Nightgate Inn, a remote inn between Dawnstar and Windhelm. She will then task you: "See if you can't 'convince' one of those innkeepers to help you. One way or another, get me those documents. But don't do anything rash if you go to Windhelm." Obviously, Rikke recommends the Nightgate Inn due to its remote location, but leaves the decision and strategy to you. The courier will never stay long at the inns, and will leave soon after your arrival. The only settlement the courier passes through is Anga's Mill. It is possible to wait for the courier there and get the more accurate map marker. The courier owns the second room on the left inside both inns, and will reside there if he is present. The courier may be killed by wild animals or Viinturuth while travelling, so if he fails to show up after a while, you'll probably have to go out and look for him yourself. (Persuade) Passed: "It is? Well that's different." "Maybe some gold will help?" (Bribe) Passed: "Well, if you insist..."
"I don't have time for this... I can get rough with you if I have to." When you have successfully finished the persuasion, both innkeepers will now say: "He's in the inn. Look around. I'm sure you'll find him. ", if the courier is present, or "He was here, but he left. If you leave now, you can probably catch him. Or, you can just wait here. He'll be back soon enough." Pickpocket the documents from the courier. This is easily done when the courier relaxes in his room at Candlehearth Hall, as no witnesses will be present. When he leaves an inn, follow him into the wilderness and wait for the wildlife to kill him. Insult him and make him follow you into the wilderness and locate some wildlife that can finish him off. Lastly, you can kill him yourself. The goal is to do it when no witnesses are around to avoid a bounty. The two methods above will always lead him into seclusion in the wilderness and work perfectly. Additionally, the courier can be stealthily killed inside his room at Candlehearth, especially if he decided to sleep. It goes without saying that Nightgate is the safest spot to achieve your goal, as Windhelm guards will be all over you if you cause a racket in their city. When the courier is dead, claim the documents from the body and head back to Legate Rikke in the camp. 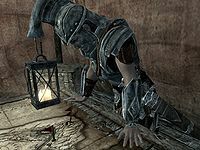 When you return to Legate Rikke and hand her the documents, she will immediately start forging the documents, saying: "Very good... Let's see what you have here. Interesting... They know more of our plans than I expected... It would seem Fort Dunstad is in need of reinforcements... We'll make sure they won't be getting those... One moment while I 'correct' some of these documents... That should do it. Make sure those forged documents get to the Stormcloak commander in Dawnstar. It'll throw him off our trail, allowing us to maneuver more freely." 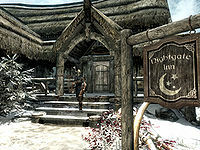 When you arrive at Dawnstar, follow the map marker to Frorkmar Banner-Torn, who will most likely stand near the Skyrim map inside The White Hall. When you approach him, his dialogue will differ depending on your choice of armor. 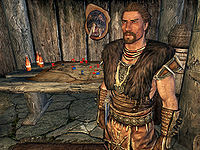 If you are wearing anything but Stormcloak armor, he will get suspicious: "Is that so? I don't recognize you. Why aren't you wearing your Stormcloak colors?" You will then have to tell him it is easier to sneak past the enemy without the uniform, and he will admit: "I suppose it would be. Good thinking." He will then continue on, saying the same thing as if you were wearing Stormcloak armor: "All right. Let's take a look... Ah, good. Looks like the reinforcements for the fort are on the way. And we have some information about enemy troop movements as well. Excellent. It's not easy running messages, what with Imperials scouts crawling all over the place. Well done. Why don't you grab yourself a drink at the Windpeak before heading back?" He then hands you 5 gold as a small token of his appreciation, and the quest will end. Back in the Pale Imperial Camp, Rikke will reward you with a leveled amount of gold and will have your next task ready, inspired by the false information you gave to Frorkmar, specifically the quest The Battle for Fort Dunstad. This quest and A False Front (Stormcloaks) are different radiant versions of the same quest. If Dawnstar is given to the Imperials during Season Unending then this quest will not be given to you. Killing the Stormcloak courier will count as murder, even if he attacks you first. If a nearby NPC witnesses your "murder", you will incur a bounty in the Pale or Eastmarch. 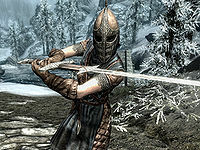 10 Legate Rikke has sent me to intercept the Stormcloak Courier passing through the area and relieve him of his documents. I am then to return to base camp where I will receive forged documents that I, posing as an enemy courier, will deliver to the enemy commander in Dawnstar. This page was last modified on 4 April 2019, at 18:02.